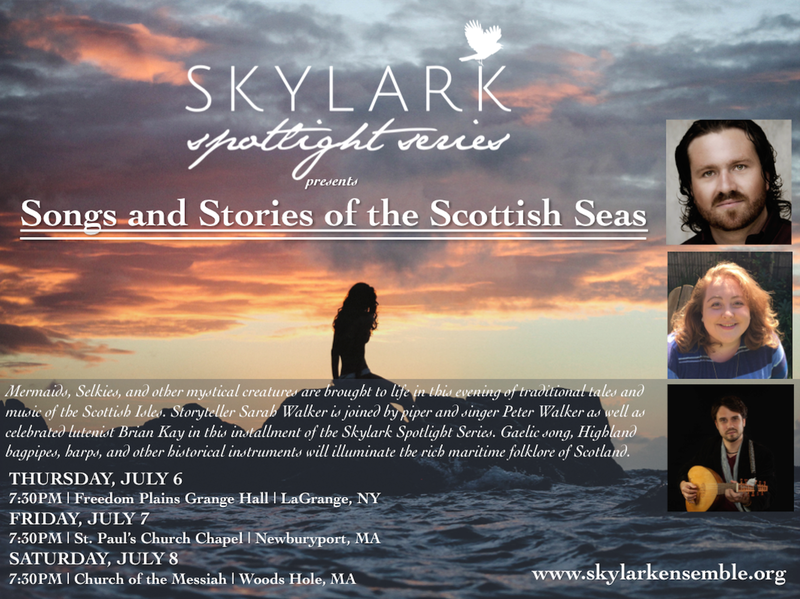 ​Skylark Spotlight is an engaging series of recitals where audience members can hear our individual Skylarks in a more intimate chamber setting, whether through small ensemble performances, or individual cameo appearances in a variety of genres. A musical exploration of the legend and history surrounding Robin Hood, featuring folk, Medieval, and Renaissance music from France and the British Isles. Skylark Soprano Fiona Gillespie joins with her sister Genna (a fiddler and vocalist), and instrumentalists Paul Morton and Bradley King. Join Skylark soprano Sarah Moyer and pianist Nate Salazar as they explore unique celestial characters in compositions by Jonathan Dove, Adam Jacob Simon, and other modern composers, as well as a world premiere by composer Benjamin Montgomery. Mermaids, Selkies, and other mystical creatures are brought to life in this evening of traditional tales and music of the Scottish Isles. Storyteller Sarah Walker is joined by piper and singer Peter Walker as well as celebrated lutenist Brian Kay. Gaelic song, Highland bagpipes, harps, and other historical instruments will illuminate the rich maritime folklore of Scotland.